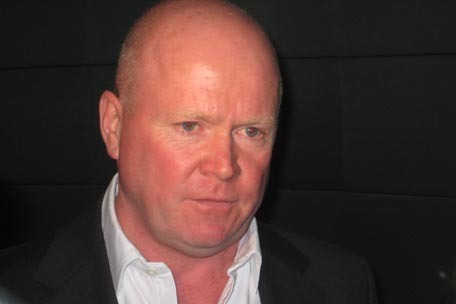 EastEnders' Phil Mitchell is to be arrested in a terrifying dawn raid. The Walford hardman - portrayed by Steve McFadden - will receive a midnight visit from police next week, who have been issued with a search warrant in the hope of locating the stash of stolen watches the burly bruiser is currently hiding. Although their search turns up nothing, officers vow to return to scope out the Queen Vic pub, his garage at the Arches and the R&R nightclub. A source told The Sun newspaper: "At first Phil is really worried but then he becomes angry about the sudden police attention. He knows he's got an enemy out there and he vows to finally root them out." However, things only look set to get worse for Phil, as it was recently revealed he would be charged with a murder he didn't commit after his mystery stalker exposes the role he had in Kevin Wicks' death and officers re-examine other crimes he may have been involved in. This leads to Phil being accused of killing his former fiancee Stella Crawford, who leapt to her death on their wedding day in 2007 after her abuse of stepson-to-be Ben Mitchell came to light. A source explained: "The police have always been interested in Phil and with his chequered history his many ghosts from his past are coming back to haunt him. "It's been a long time since Phil thought about Stella so when the police bring her up he's not at all happy. He didn't murder her but it's not looking good for him. "On paper Stella was a harmless spinster but, as everyone knows, she was a deranged loony who abused Phil's son Ben. There's a lot of trouble ahead for Phil as the cops are desperate to lock him up and throw away the key."